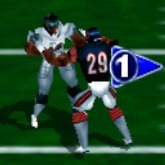 Description: NFL Blitz is a crazy 3D arcade style football game that came out in the 1990's. It's known for it's jungle football style of play. Where rules are kept at a minimum. This is the fastest and most chaotic gameplay you will ever see in a football game. Play season mode, based on NFl 1998 roster. What I like best about this game is the one handed catches and the tackles are amazing. Me and my bro used to play this for hours back in the day. very competitive and fun! Game Controls: Enter Key = Start Button. Arrow Keys = Move. "K" Key = Select Player, Throw Football. "L" Key = Jump, Tackle.